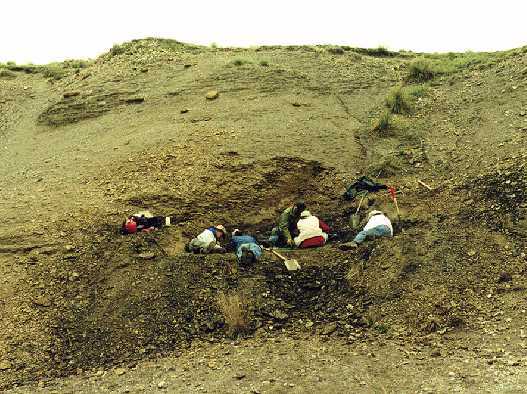 Late in the morning of June 4, 1998, my wife, Pam, and I met Dr. Glenn Storrs and the Cincinnati Museum field crew (Nick Bailey, Janet Bertog, Grace Castellini, Jim Clark, and Ginny Henderson) at the plesiosaur dig site just north of McAllaster, Kansas. It was the second time that Pam and I had been on the site. 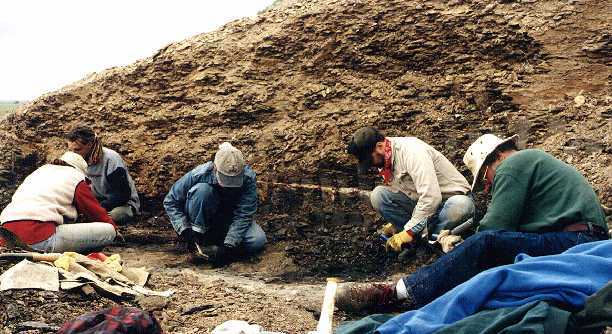 The last time (1994) when Pete Bussen had taken us there, I found three gastroliths that had been overlooked in the 1991 dig. 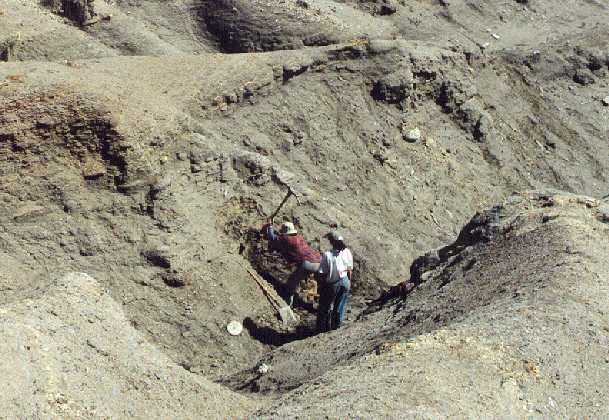 This site was within a mile of the type locality (located at the upper left of the picture shown below) of the type specimen of Elasmosaurus platyurus discovered by Dr. Theophilus H. Turner (1841-1869) at McAllaster Butte in 1867. At the time, Dr. Turner was a young Army surgeon stationed at nearby Fort Wallace. He sent word of his discovery to Professor Edward D. Cope (1840-1897) of Philadelphia. The specimen was shipped to Cope in 1868 who initially re-assembled the animal with the head on the wrong end. The discovery of his mistake has been cited by many authors as the source of the "Bone Wars" feud between Cope and his rival, O. C. Marsh (1831-1899) of Yale. In fact, it was Joseph Leidy (1823-1891), Cope's mentor, who pointed out the error in 1870, not Marsh. Marsh actually waited 20 years before claiming publicly that he had told Cope of his mistake. This photo (CLICK TO ENLARGE) is the view from the pasture as we drove into the site. 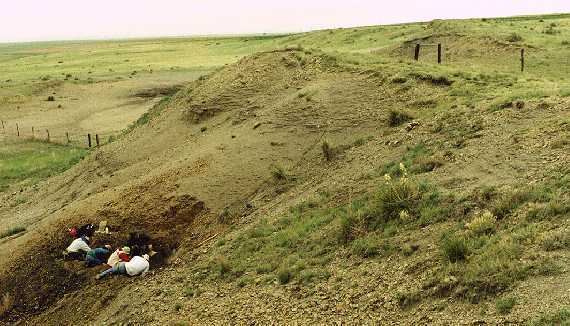 The Cincinnati Museum field vehicle is the center and the dig is at the extreme right edge, behind the hill. McAllaster Butte is in the background. The exposures are all late Cretaceous (Campanian) Pierre Shale near the contact between the Sharon Springs and Weskan members. The weather was foggy and unseasonably cold (40 degrees F), so first we made a side trip to a store in Colby (25 miles) to buy some cold weather supplies, including gloves, sweat shirts and jackets. 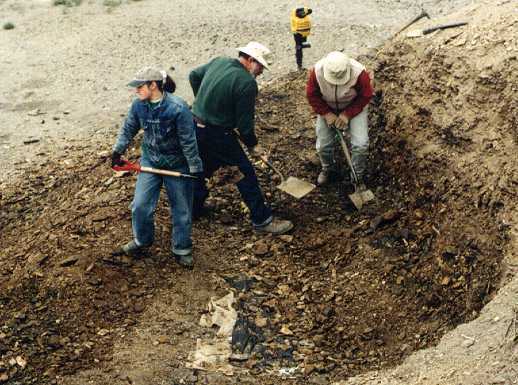 The Cincinnati crew had re-opened the site (with permission from Larry Martin at the Natural History Museum at the University of Kansas) of a large long necked plesiosaur (probably an Elasmosaurus) that had been discovered by Pete Bussen several years earlier. Even though the original dig on the specimen by Larry Martin and John Chorn in 1991had turned up ribs, vertebrae and huge (3 pound!) gastroliths (KUVP 129744), the latest efforts had, so far, yielded only a few ribs. 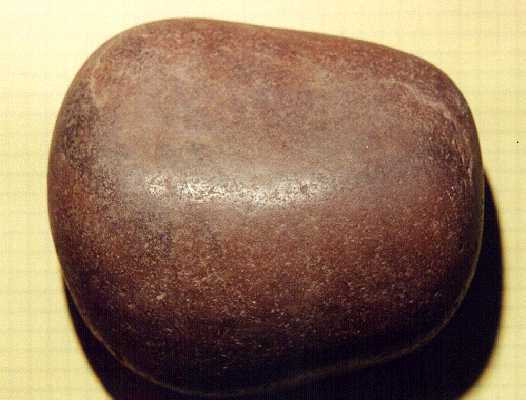 For more information on this specimen and gastroliths in general, go HERE. 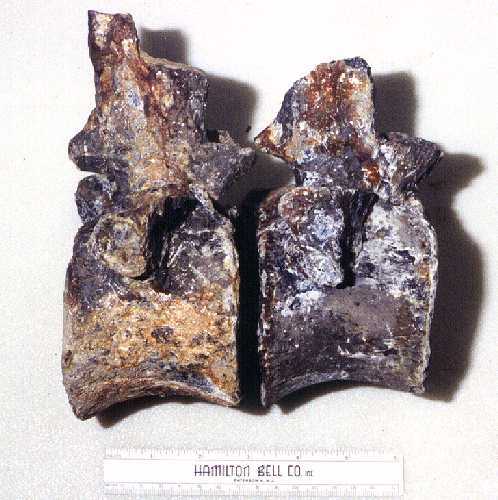 In 2002, I learned that George Sternberg had found 7 seven similar plesiosaur vertebrae (FHSM VP-398) at the same site in 1954. A comparison of the 1991 KU and 1954 FHSM specimens in June, 2002, showed that they came from the same animal. The story becomes even more interesting when you consider that these vertebrae, ribs and gastralia are the same bones that E. D. Cope (1869) noted were missing from the type specimen of Elasmosaurus platyurus. Add in the fact that they are the same size, and come from the same strata, and the situation becomes even more interesting... stay tuned for further developments. When we arrived, the Cincinnati crew was working on a small bench about half way up a steep slope on the east side of a small hill. They were still exploring the site, trying to locate where the previous dig had left off. 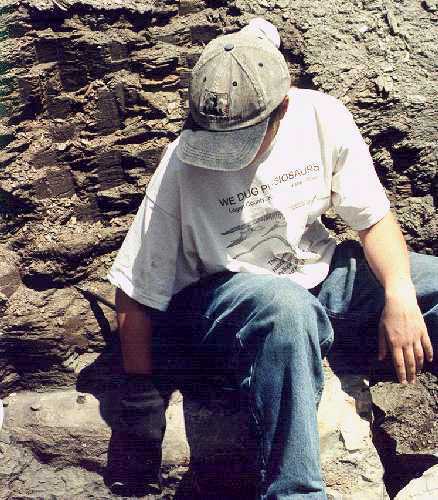 The shale had weathered a lot in the years since the original excavation. The field crew had exposed a jumble of ribs at the edge of the hillside and had started working further into the hill. At this point, the problem soon became the removal of more and more shale overburden the further they went into the hillside. 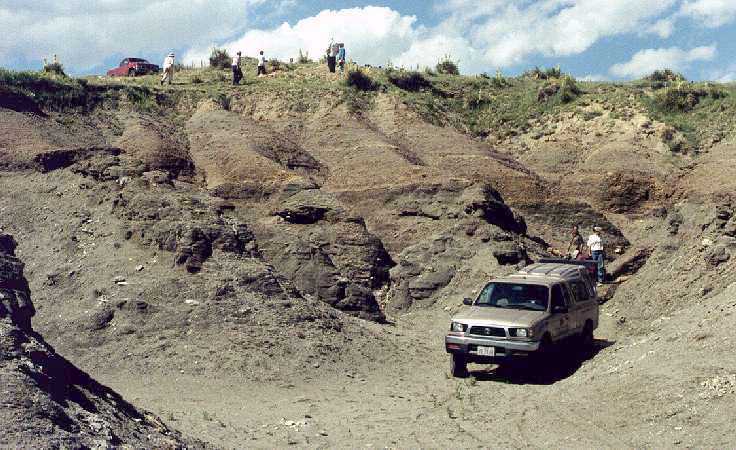 The bones were found in the Sharon Springs member of the Pierre Shale formation, a late Cretaceous deposit (Campanian age) in the Western Interior Seaway. The shale was easy to dig where it was weathered at the surface, but got harder as we dug into the side of the hill. During the afternoon of June 4, we enlarged the working surface several times by use of a gasoline powered jack-hammer. Having never used one before, I had to try my hand at it, and discovered that it was a real labor saver when it came to cutting through large amounts of overburden. As the exposure got wider and deeper, we kept looking for more remains. While we hoped to find more vertebrae or limb material, we continued to find only ribs. 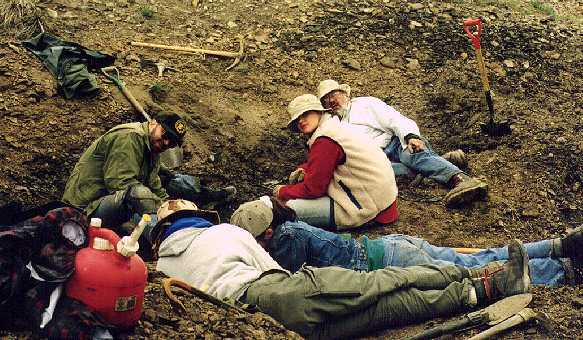 One problem with taking pictures of paleontologists is that they almost never look at the camera...... they are always looking at something much more interesting in the dirt in front of them. From left to right are Grace Castellini, Nick Bailey, Ginny Henderson, Dr. Glenn Storrs, and Jim Clark. Gin, Jim and Grace pitch in to remove loose rock after the Jim, Glenn and I had used the portable jack hammer to cut through the unweathered shale. The pit had reached about half its final size at this point. In plesiosaurs, the rib structure is somewhat more complicated than in most other animals since it consists of curved, dorsal ribs that are attached to the vertebrae, and several sets of gastralia ribs that are joined together across the belly of the animal. In this case, we were finding an almost equal mixture of dorsal ribs and gastralia, and nothing else. Later in the afternoon, the crew encountered a plastic sack covering a complete dorsal rib that had been exposed during the earlier dig, and then found another dorsal rib right next to it. 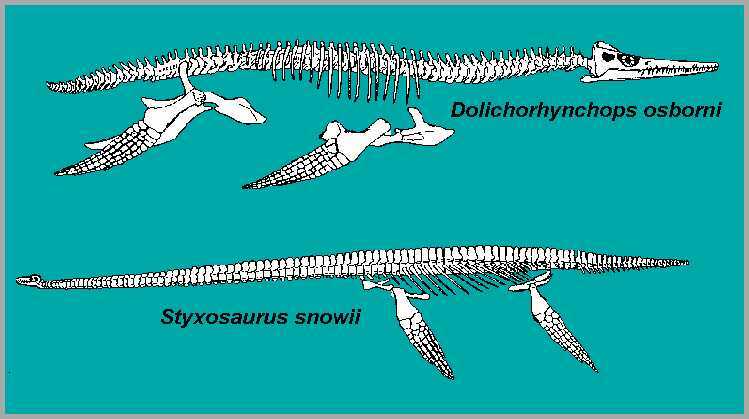 The dorsal ribs were about 26 inches in length while the gastralia were about 18 in length. Adding everything together, this animal would have been about 40 (100 cm) wide at the chest (and about 40-45 feet long!). "Down in the hole"..... This time, Glenn, Grace and Jim actually look up at the camera while Nick and Gin keep right on digging. 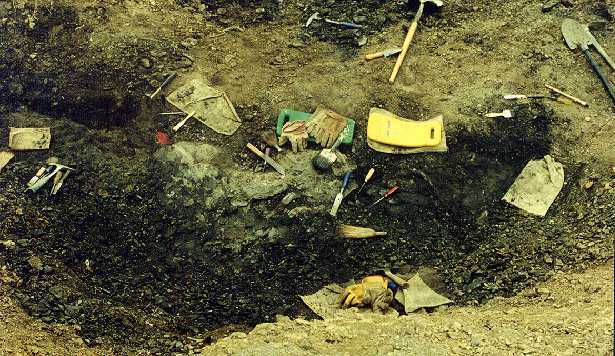 The shale had to be carefully 'explored' one small area at a time until bone was encountered. Time for a break! This is a shot of the dig taken from above at the end of the first day. The gray area near the center contains a jumble of ribs. Two other ribs are visible below the yellow knee pad. 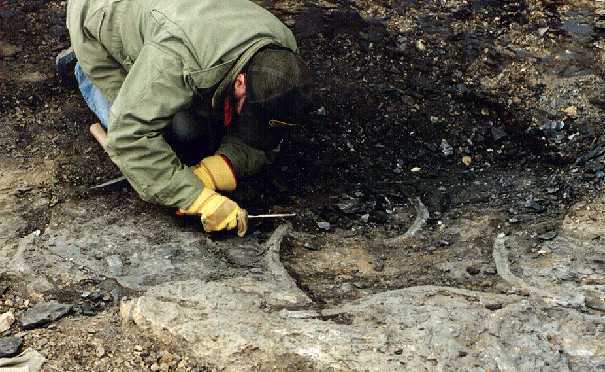 A large dorsal rib left by the previous crew is covered by a cloth bag at the far right. Although extensively explored at this point, the area at the right hand side of the picture was devoid of any plesiosaur remains. As the afternoon came to a close, the wind came up and the sky got darker. We left the site, drove across the pasture to the nearest road, and went back 40 miles to our motel in Oakley. The Cincinnati field crew was camping at a roadside park outside of Wallace, Kansas, and I really did not envy their stay in tents in the cold weather. ".....and I earned a Ph.D. so I could do this?" 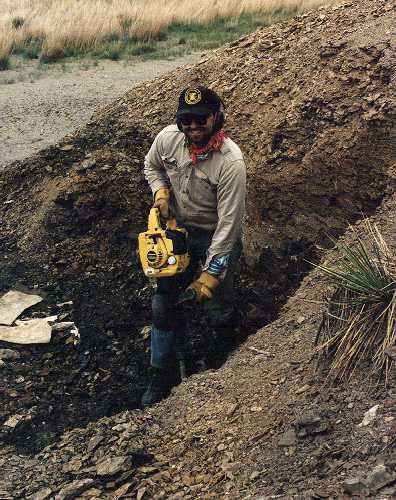 Glenn Storrs shows us how to operate a "Big Boy Toy".... a gasoline powered jack hammer that made the dig go much faster, especially in the harder, unweathered shale. The next morning (June 5) was even colder than the previous day, but not as damp. The clouds seemed a little higher and not as threatening. When we arrived, the crew was at work expanding the dig site again. 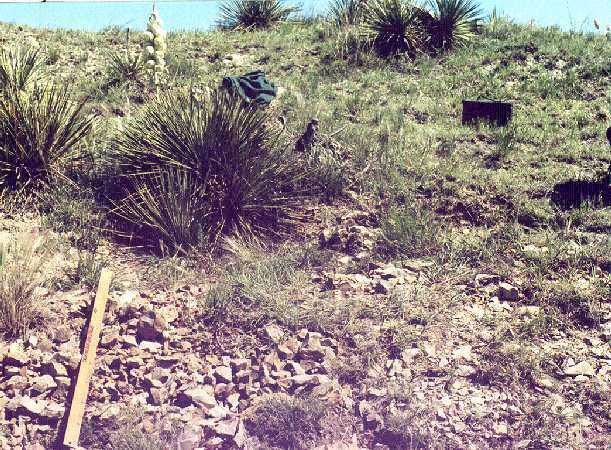 The area exposed was roughly half-moon shaped, about 25 feet in width, 10 feet back into the hill at the center and 7 feet deep at the center. I took my turn on the jackhammer and we broke out the shale down to a level about 6-10 inches above the level of the bones. 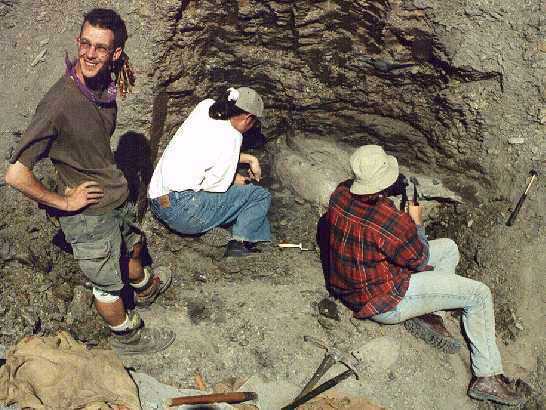 In this photo, Glenn Storrs has assumed the obligatory "fossil bone worship position" well known to all real paleontologists. It must have worked for him. Picking away with his magic screwdriver, he managed to find lots of plesiosaur ribs.....at least he found a lot more than the rest of us did! Late in the afternoon, I measured and mapped the site, drawing in the locations of all of the ribs that had been found. By that time, we had located about 18 ribs and gastralia, but nothing else. 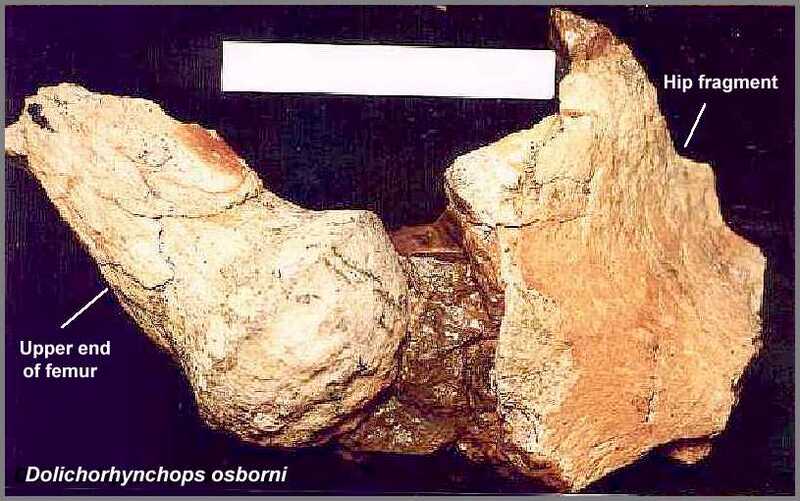 Dr. Storrs surmised that this specimen had been deposited as the result of a bloated (floating) plesiosaur carcass that had come apart, dropping the ribs, a few vertebrae and the gastroliths from the stomach in a pile on the sea bottom. By the end of the day, he had also decided that the dig had reached the point of diminishing returns and decided to call a halt. No one protested the decision since we were hoping to move to a more productive site a few miles away. Jim Clark, a very patient college teacher from the Cincinnati area, was more than ready to do something else. He had had the dubious honor of digging for two and half days without finding anything. His bad luck had nothing to do with his ability..... even big fossils have to end somewhere and that was where he was digging. Although I had not spent nearly as much time on the site as the others, my record was also a big zero for finding things (well, I did contribute a couple of gastroliths that came from down the hill that the first dig had missed). Glenn Storrs, on the other hand, was finding ribs everywhere he poked his magic screwdriver. In spite of everyone's hard work, however, there was simply nothing left to find. We left about 4 PM and took one of the Cincinnati crew (Janet Bertog) to visit Chuck Bonner the Keystone Gallery 20 miles south of Oakley. Janet is doing her graduate work on the Pierre Shale and had been trying to find a good exposure of the shale. We knew of a location near the old town site of Elkader (home of the Sternbergs in years past) and took her with us. Chuck took her out to the exposure while we talked fossils with his wife, Barbara. Chuck and Barbara have been collecting fossils for years and now have a Keystone Gallery website up on the Internet. 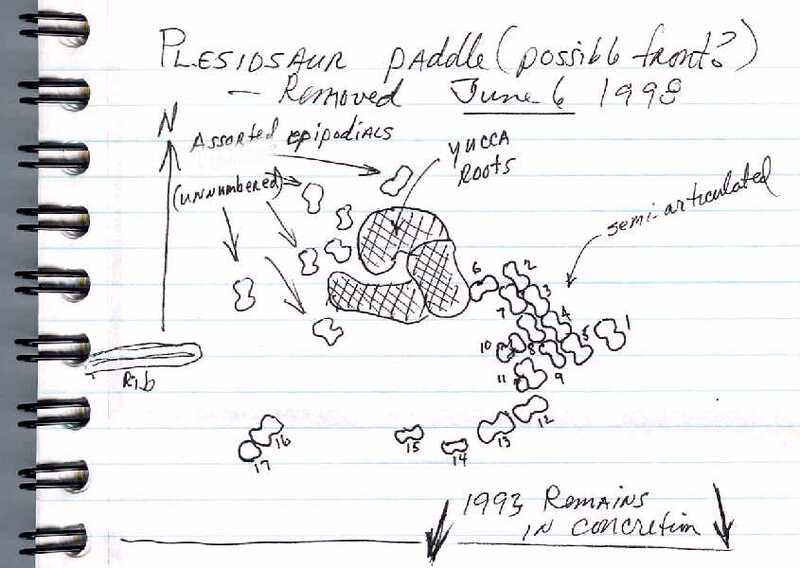 On June 6, we visited Coal Oil Canyon southeast of Wallace where we had dug on a Styxosaurus with the New Jersey State Museum, and where Pam had discovered another plesiosaur (probably a large polycotylid called Dolichorhynchops) coming out of a concretion in 1992. 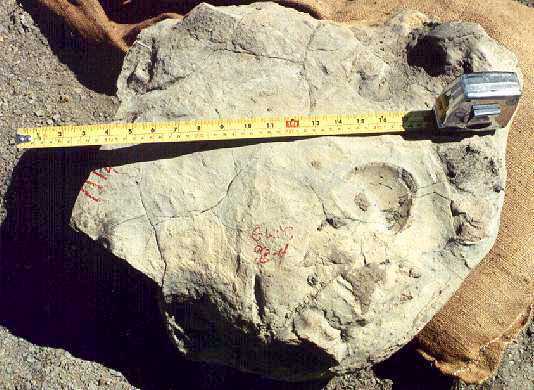 Most of the bones were badly shattered by the concretion and we were not able to recover much, except for a nice chunk that included part of a podial and the hip (scale = 6 inches) We had not dug outside the concretion in 1992-93, and wanted to see if there was anything else there. For more pictures of this large plesiosaur, go to my Pliosaurs and Polycotylids webpage. The specimen (CMC VP-7055) was donated to the Cincinnati Museum Center in 1999 and photographed there in 2003. 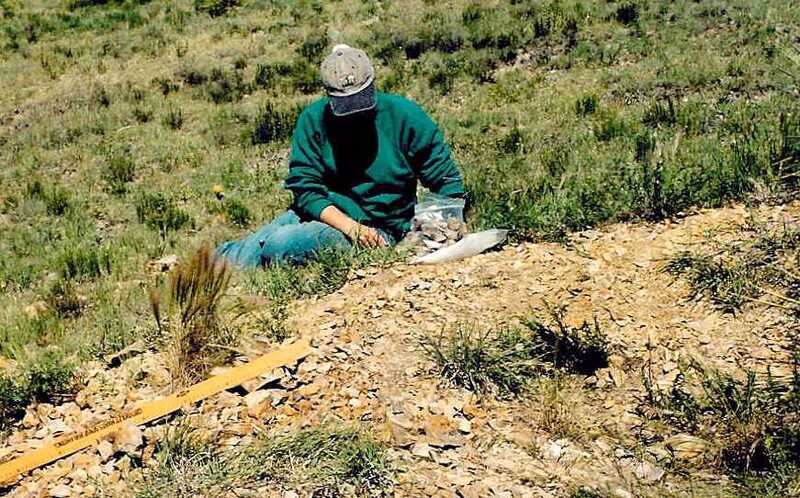 Here Jenny Henderson looks for bones amid the fragments of the concretion which was originally located in the depression at the lower right of the picture. The hill drops off steeply behind Jenny and some of the plesiosaur bones had gone "down the hill" a long time ago. We found the remains of what was probably one of the rear paddles under a near-by yucca plant. The yucca roots had covered some of the paddle bones and generally got in the way of trying to do a systematic dig of the area. After a couple of hours, we had managed to locate about two dozen epipodials and a rib fragment. (See field notes). This was all that remained of a paddle that should have looked like this. The search was somewhat hindered by the vegetation, some of which had sharp spines. About the same time, there was a bit of excitement from down the hill. Nick Bailey had found his first mosasaur and had enlisted the rest of the crew to help him dig it out. The bones were completely enclosed in a gray concretion. Nick is the guy with the BIG smile on his face. 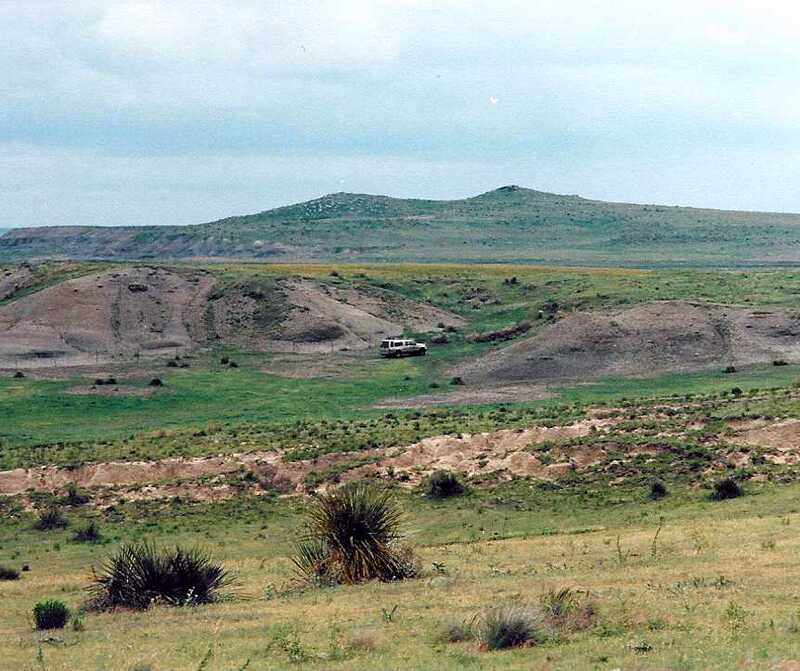 A view of the mosasaur dig from the plesiosaur dig site on top of the hill. Here Grace handles the pick while Jenny watches. Grace Castellini and Jenny Henderson ponder "How in the world are we ever going to get this chunk out of here?!" 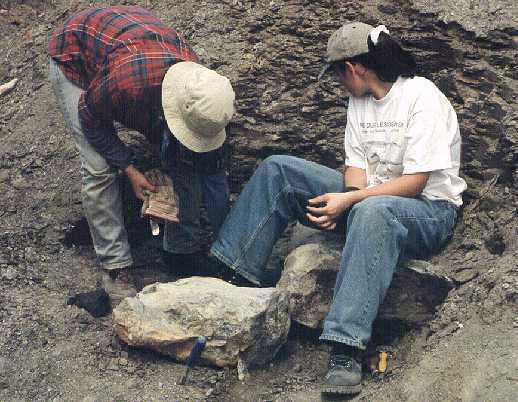 Here Jenny clears some of the shale from around the edges of the concretion. A close-up of the one of the concretionary masses that had washed out on its own. 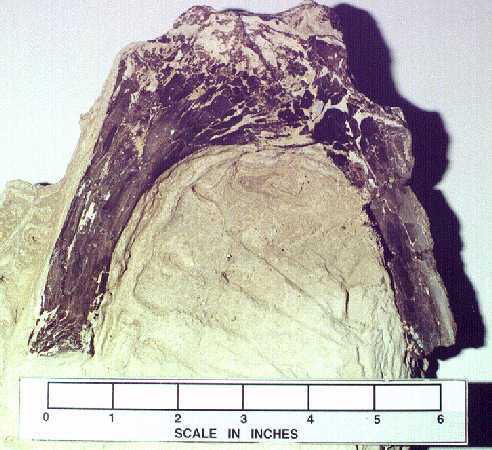 Several vertebrae (Tylosaurus) are visible. 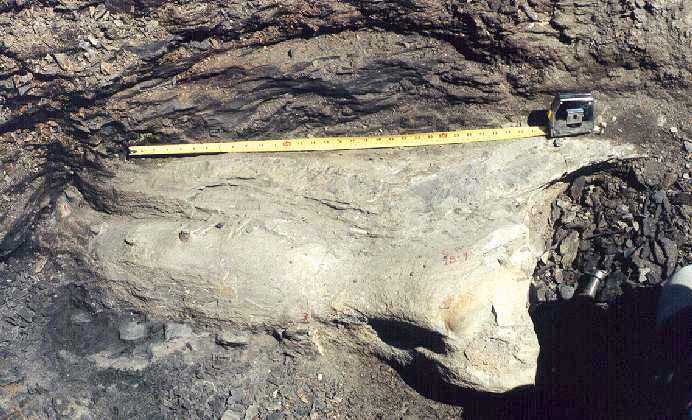 Another view of the "big one" that was still securely enclosed by shale. A view of both dig sites from down in the gully (or canyon, if you prefer). The museum truck was backed up to the mosasaur site to facilitate loading the concretion containing the bones. On June 7, we took it easy for a while waiting for the Cincinnati crew to meet us at the motel. They were operating on Mountain Time instead of Central, so they got a later start and did not arrive until about 10 AM. We drove south to our site and a few of us re-opened the dig while the others explored the surrounding chalk badlands. 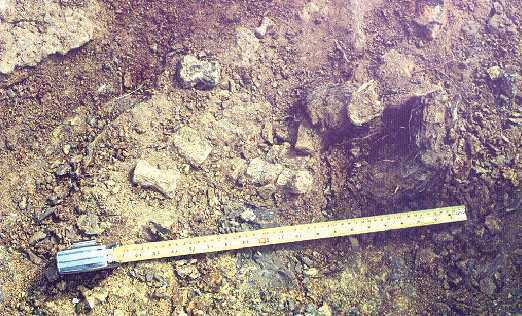 Although we found bone immediately at the edge of the previous excavation, it turned out to be a single large bone (the scapulo-coracoid) and nothing else was found. We closed the site and then moved a half mile further north to explore the chalk. By the time we left, Gin Henderson had become the champion sharks tooth finder of the day, picking up a whole handful of teeth in a couple of hours. Not bad for her first time in the chalk! We finally gave up about 5:00 PM and headed for home. The last four days had not been totally successful, but it was a learning experience that was enjoyed by all. Credits: The drawings of the plesiosaurs at the top of the page were adapted from Kansas Geology, Rex C. Buchanan, Editor, University Press of Kansas, 1984 Used with permission of Rex C. Buchanan.